Our church’s story begins at the home of Colonel Peter Adamson in 1825. His home, then called “Toronto House”, was situated on a farm about a mile west of Erindale on the south side of Dundas Street – about the middle of the present Sheridan Homelands subdivision. Dr. Joseph Adamson, William Thompson, Frederick Starr Jarvis of Toronto Township, Alexander Proudfoot, and Henry Carpenter of Trafalgar Township. It contained two acres and 32 perches and was part of Lot 3 in the first Concession north of Dundas Street. This was in the village then known as Credit. After many hours of labour, freely and generously given by many people, the church was ready for the first service on November 18, 1827. In 1828, the church was consecrated St. Peter’s, thought to be named after the patron saint of Colonel Adamson. 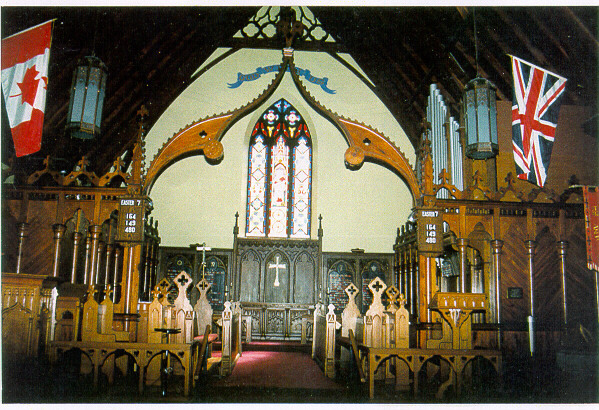 The white frame church had 12 pairs of box pews in the centre block facing the pulpit, and with an aisle down each side of the centre block, were 5 pews on each side facing the aisles. These pews were rented to the parishioners with the exception of the two back pews and the pews in the gallery which were rent free. A Melodian was acquired in 1856 for 25 pounds. This first church served until 1886, when plans were made for a better and larger building. 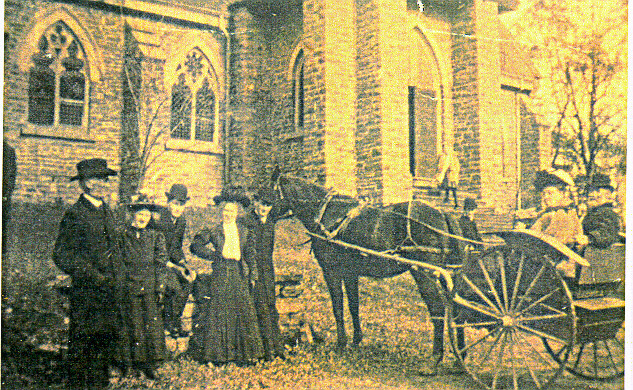 In May, 1887, it was torn down and the new stone building begun. We have a prayer stool and the spire from the old church, and as far as we know, these are the only articles remaining from the 1827 church. The building of the second stone church was done by the Building Committee which compromised of T. M. Hammond, Alfred Adamson, A. B. Harris, Frank Morley, John Crozier and W. A. Schreiber. The new church was to be built from brick or stone or “a combined stone and brick church” at a cost not to exceed $6,000 unless a further sum was available, and it deemed advisable to use it. Weymouth Schreiber paid out of his own pocket about $1,200. His wife, Charlotte, a noted artist, painted many pictures, and sold them to aid the Building Fund. 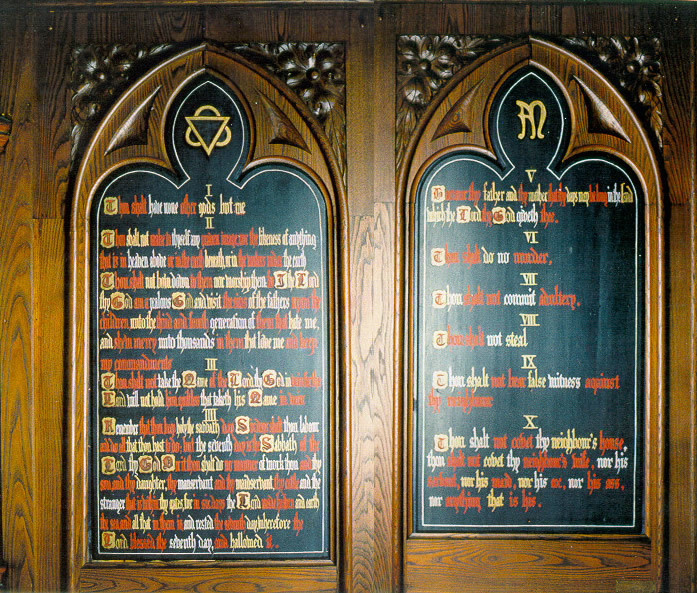 Mrs. Schreiber also inscribed the panels of the Lord’s Prayer, the Creed and the Ten Commandments now in the chancel. Miss Anna Magrath gave the Memorial Window over the altar in memory of her father, the first rector. The side windows were given by the Harris family. The rector at this time was the Rev. R. W. Hindes. The stone for the second church was all taken from the Credit River, a hard job and many men and boys gladly gave their time and the ladies supplied food and drinks. Many teams and wagons or sleighs were needed to transport the stone up from the river. The tower and spire were added in 1910 for $3000 when the Rev. H. V. Thompson was rector. He was a strong and able man who, together with the help of many people, dug stone from the Credit River to build the tower. Through the years, bequests and gifts to the church gradually improved its interior as rectors came and went. In 1930, St. Peter’s Church was featured in the Jalna novels by Mazo de la Roche. In the depression years of 1934, the parishioners hewed out a basement under the church for the Church School. During W.W.II, St. Hilda’s School in Whitby, Yorkshire, England, decided to evacuate about 100 girls to Canada for safety. They stayed from 1940-44 at “Glen Erin”, close to St. Peter’s Church. The sisters, teachers and girls attended every service at St. Peter’s until the war was over. The people of the parish took these children into their homes for the holidays and a lasting friendship was made with St. Peter’s Church. In 1959, the Narthex, Church Hall and kitchen were added. The classrooms, offices, and parking lot were completed in 1966, which completed the beautiful church we know today. In recent years, the chancel and the narthex have been restored. In 1994, the Magrath Memorial Window above the altar was restored and rededicated by the Primate of Canada, the Most Rev. Michael Peers. 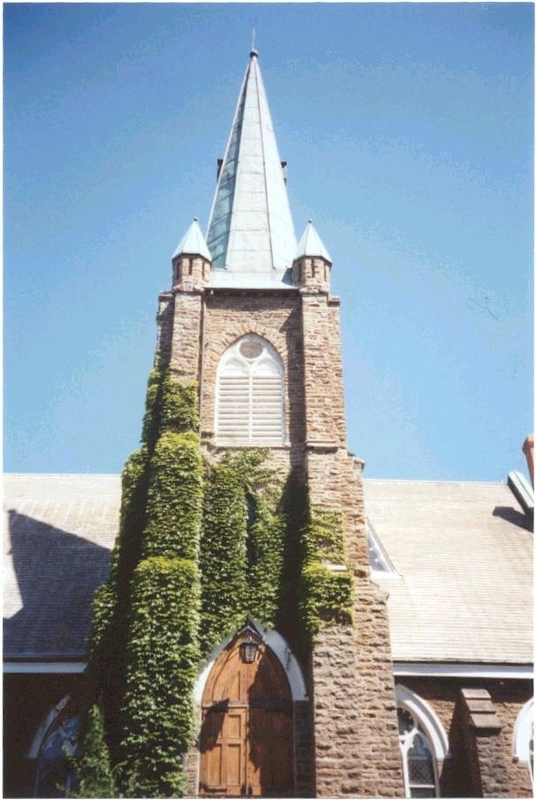 In 2000, St. Peter’s celebrated its 175th anniversary during the incumbency of the Rev. Stephen Paul Booth. Today St. Peter’s is fortunate have The Reverend Canon Jennifer E. Reid as our incumbent, the fulfillment of long-term relationship that began with her first appointment as assistant curate at St. Peter’s in 1989. Canon Reid was appointed Incumbent in 2002. St. Peter’s official historian for more many years.